Bobo the Chimp has come into some money and he wants to share his fortunes with you. Click here to play! Spin these reels for a chance at some of this Monkey's Money! Keep a close eye out for Bobo, as he is the top symbol in this classic 3 reel game. Spin three of him across the single pay line and you'll bring in the biggest payout of 3000 coins. He's also thrown a few other symbols to help you collect his cash, including lucky sevens. Spin three of these red numerals across the pay line and you'll bring in up to 600 coins. Triple, double and single BARS will help you out, paying out up to 200, 80, or 30 coins respectively. Don't forget about the bananas. Bobo, will pay out big if you can bring in the bananas. Spin three bunches across the reels and get up to 20 coins. 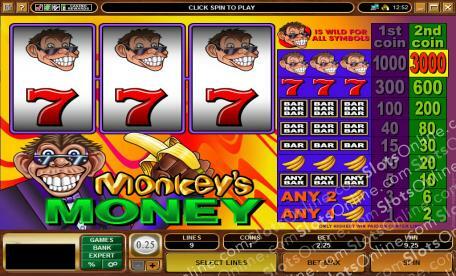 In addition, there are a few other combinations that will help you in your quest for Monkey Money. This 3 reel game takes a max of two coins, so be sure to bet them both to activate the highest pay table and it won't be long before Bobo is handing over some of that monkey fortune! Bobo the Chimp acts as a wild symbol. He will replace all other symbols to help you spin in more wins.